Trails for Tails – December 6, 2014 | NC Race Timing and Running Events | Go Time! PARKING Participants may utilize the parking that is typically used for the Framers Market. Additional parking is available at the nearby Baptist Church! TRAIL RUN! The race will be a trail run through Abbey Nature Preserve, adjacent to Poplar Grove Plantation. The 5K (red line) is one big lap around the outer Abbey Nature Trail and accompanying Foy Farm. 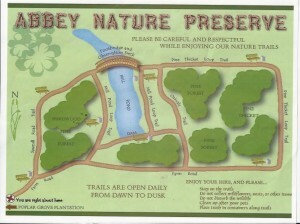 The 1.8 mile walk (yellow line) is one lap around the outer Abbey Nature Trail. The run consists of sandy farm road, hilly single track, wooden bridges and fire roads. There are numerous exposed roots. While not necessarily a technical course, you’ll need your wits about you, particularly during the last mile as added elevation changes and course narrowing will increase the difficulty of the run. 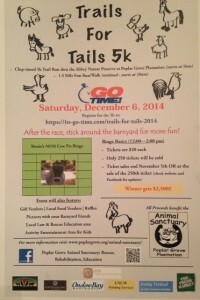 FROM THE RACE ORGANIZERS: This race benefits the Animal Sanctuary at Poplar Grove Plantation. The Animal Sanctuary began renovating its established farmland into a farm animal rescue site in earl 2013. It is currently an accredited rescue site with the United States Equine Rescue League. Their mission is to create awareness, rescue, and foster neglected and abandoned farm animals by providing a safe and nurturing haven for the animals. 5K TEAM PACKAGE This is for a team with a minimum of 5 ADULTS participating in the 5K. Please email jenn@its-go-time.com before registering to get your team code for $5 off per participant. 5K CHILDREN 5 AND UNDER – Free! 1.5 Mile CHILDREN 5 AND UNDER – Free! FAMILY PACKAGE This is for a family of 2 adults + 2 or more children participating in the 5K or the walk. Please email jenn@its-go-time.com before registering to get a discount code for 20% off each participant. RACE SHIRTS: Shirts are guaranteed to those who register before November 10th. The shirts are made of a dri fit/sport tek material and are available in male and female cuts as well as youth sizes. FAQ & GUIDELINES Waiver: The Registration Agreement & Liability Waiver is linked to the Online Registration. This must be selected and approved during registration. Refunds: Refunds requested by participant are as follows, minus any credit card processing fees: More than 60 days from event: Full Refund Less than 60 days, but more than 30 days from event: 50% Refund Less than 30 days, but more than two weeks from event: 25% Refund Less than two weeks from event: No Refund Event cancelled due to severe weather: No Refund Entries are not transferable to other races Timed by Go Time as each race is organized by a different group. We must stick to this policy as race items have been purchased based on current registrations and it is not fair to choose who receives a refund and who does not.